1. Why am I not getting a better response rate from my direct mail campaign? 2. Why am I getting so much returned mail from this year’s campaign? 3. How can I create effective marketing campaigns when my CRM is full of duplicate and non-standardized records? The first two issues can really come down to undeliverable mail due to outdated or incorrect address information. 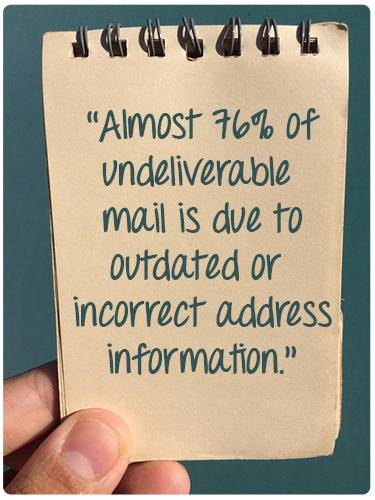 According to the USPS, almost 76% of undeliverable mail is due to consumers or businesses moving. This is an easily correctable problem with the Post Office’s National Change of Address (NCOA) database, but keep in mind that this type of processing only helps if you’re also applying any changes made to your master database as well. The most common type of NCOA processing only works for an address for 18 months following its first inclusion in the file – making your chance to update the record in your system finite. The USPS also lists missing secondary information as a problem that causes undeliverable mail in about 12 percent of cases. This means that the address used is not showing a necessary apartment or suite number. Utilizing the precise address is extremely important now that the USPS has embraced automation. Previously, you could often rely on a carrier to personally review the address and deliver to the right party since experienced carriers knew who lived where. That’s not the case anymore. Lastly, the USPS lists vacant addresses as the third biggest reason for undeliverable mail, at about eight percent. While not huge, this can still have an impact on your mailing. This vacant list is an optional file that printers and letter shops can purchase, so you’ll want to confirm that your data handler has made that investment. Keep in mind that you would only discover these data quality issues if you’re sending First Class mail. By sending First Class, mailers get feedback on Undeliverable as Addressed mail (UAA) so that they can update their records. Many companies mail Standard Class, so 90 percent of the time their UAA mail ends up as waste. A good sign that this is happening goes back to question number one – there are no responses to your direct mail campaign. Now that we covered the first two questions, let’s review the third most common question we get – what to do about the CRM. If you’re using your data for marketing campaigns, it’s critical to have standards and a process for updating your customer information regularly. Many people treat data cleanup as a one-time process, but it needs to be maintained by establishing business rules and an ongoing procedure. Some of our customers submit to a monthly or quarterly hygiene process. There’s no absolute standard – just be sure you are doing it regularly. If you’re experiencing problems related to any of the questions above, you’re not alone. Organizations on average believe that 32 percent of their data is inaccurate, which is a jump from 25 percent just a year ago. The more impactful question is how to clean the data for better results. One step towards finding a solution is a data audit during which your data is reviewed by an expert who can provide you with insight and eventually a clean version of your data. Then, you can not only get your mail delivered to the right people and reduce unnecessary postal expenses, but you can also use this information to have your main database or CRM updated, allowing you to begin to build a real actionable company asset. If you’re concerned about your response rates or frustrated by the amount of return mail you are receiving, contact us to get your data back on track.